DrinkWire is Liquor.com’s showcase for the best articles, recipes and reviews from the web’s top writers and bloggers. 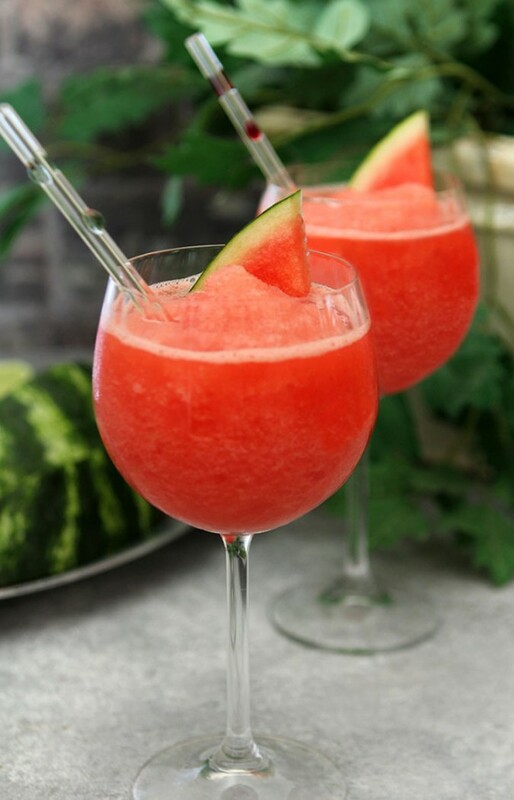 In this post, Creative Culinary offers watermelon frose. I’m not one of those bloggers with a calendar that I use to determine what to post about next; you know, making sure I’m on target with the latest trend or projected fad. Blogging is much simper for me. I decide to make something and if we love it, it will show up here with a week or two. Oh come on, who am I kidding…way too often I’ve just made it a day or two prior to posting; I only wish I was that organized…but I promise…soon I will even be back with cocktails on Friday! I’ve created more than one dish that was simply the providence of having items with close proximity in the fridge…and that’s pretty much how this cocktail came together for today. I agreed to sample a bottle of VieVité Rosé wine and opened the package up in the kitchen after it arrived yesterday. While I’ve always loved wine I don’t do wine reviews per se as I consider this to be a recipe site so I knew that I would be blending some seasonal concoction together with the wine as an ingredient. I sat it down next to a watermelon I had just purchased at Sprouts and well…there it was, right before my eyes. Almost too easy, right? That’s my excuse for being a year behind the Frosé trend…the stars had not yet aligned for me! Do you remember when Rosé wine was more synonymous with a cheap bottle of wine that we drank in our twenties…you know when the excitement of ordering an adult beverage was huge but our tastes were limited? Those cheap bottles were sweeter and come on…it was pretty too! Wow have things changed. I still love Rosé but today I prefer something with more character and depth and gone are the days of drinking any wine that is sweet; except maybe Port. Not to say that I won’t use a wine in a sweet cocktail but it’s the dryness that works so well with fruits and simple syrups to keep it from going over the top. 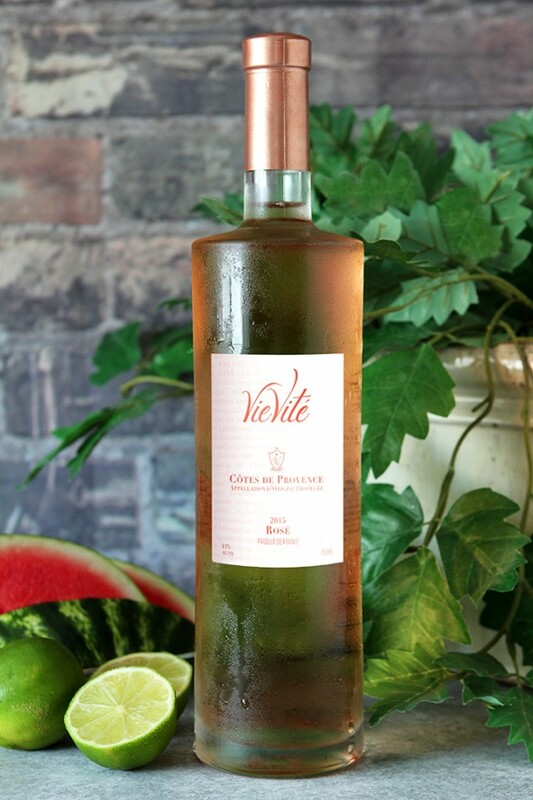 The VieVité exudes the colors of a true French Côtes de Provence rosé wine with a beautiful translucent pink hue. The nose of ripe tropical fruit is balanced with a pleasant bouquet of white flowers and a discreet touch of spice and I knew it would bring the perfect element to this cocktail. While this cocktail calls for making a batch that uses a full bottle of wine, I made a point of tasting the VieVité chilled and it was exceptional. If serving with food, it is best with with grilled white fish, salmon, crab cakes with aeoli sauce, prawns, lobster, ceviche, sushi and even a spicy seafood stew. With VieVité’s fruit forward flavors, it will also balance out and complement dishes like tandoori Thai chicken, Indian curry dishes, and ethnic foods with spicy seasoning. Considering my love of all things Italian, I see serving it with Mediterranean cuisines with olive oil, garlic and herbs like pasta tossed in fresh puttanesca sauce or traditional bouillabaisse. My job now it to locate a source in Denver; this is a beautiful wine. Balancing it with the watermelon, lime juice and simple syrup means using a light hand with the watermelon simple syrup. Taste as you go and make sure you don’t overpower the wine element with too much sugar. Looking for something a bit stronger? Try adding a bit of vodka. If making this recipe as I did, it makes a full pitcher and that’s what I wanted. I was having friends over to celebrate the end of the deck building and decorating! You can certainly cut it down or save the leftovers in the freezer; a bit of time on the counter and it will soften quickly for enjoying again. I know I’ve mentioned (probably over and over) the yard projects I’ve had going on this year so I thought I would include some photos of what’s been accomplished this year. After a full three year ‘discussion’ with my builder they finally acquiesced and replaced all of my sod. I happened to arrive home on the day it was being installed in 2014 and the contractor had tried to pull a fast one and not bother prepping the clay the sod was being installed on top of…and I’ve had nonstop problems. The yard was a minefield of both lumps and divots that were dangerous to navigate once the grass got long enough to disguise them and when watering, the water ran off the clay onto my sidewalk instead of being absorbed. Yes, I was tenacious but they had to finally agree I had a mess and it got done. At the same exact time my new deck was scheduled to start! 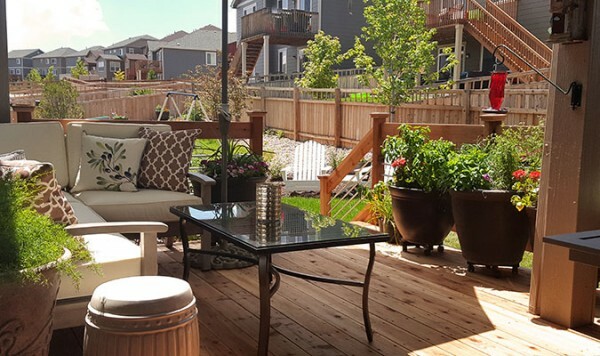 We had to postpone the deck for a bit because my yard was all dirt for almost 2 weeks; the time between sod removal and placing of new product was a bit longer than expected but I didn’t want anyone working in mud. Once it was completed, it was June and hotter than the optimum temperature for new grass so I’ve been consumed with both regular yard work and a killer water schedule. Truth be told it’s been a bit of a struggle but it’s amazing how a couple of days of cooler temperatures this past week and regular afternoon rains have FINALLY seen it start to take hold and look nice. Look it’s GREEN…Whew!! Still, the most exciting thing was the deck. I’ve waited two years for this baby. My neighbor has built several decks over the past couple of years and while not a full time deck builder I trusted him to do mine. He had done the neighbor’s next door in 2015 and was scheduled to do mine last spring/summer but he went through a difficult medical procedure and didn’t have full use of his hand so we had to postpone until this year. FINALLY…I needed it so bad! The foundation for my home was already poured when I bought it and a small back porch was included. I mean SMALL. It was 12 feet wide by 10 feet deep and that was bad enough but to make it even worse, the concrete patio was poured with a 3X3′ step that you walked out on before stepping down to the actual patio making it effectively 12 feet wide by 7′ deep. I know I must have tried my table and chairs in every configuration possible and the fact is they barely fit. Every single time someone came to visit and we went out there I felt I was on duty to make sure no one tripped on that dumb pad. 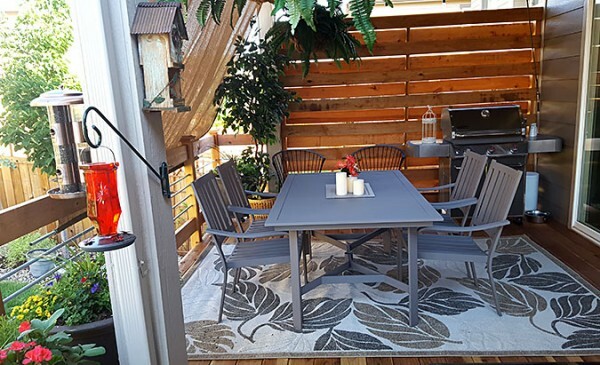 I had my 20 year old white outdoor table and chairs from Crate and Barrel sandblasted and painted with a neutral gray for the covered porch area and I had an epiphany one day and remembered a patio privacy fence my dad had made in one of the homes we lived in and before we were done I had one too. Houses are close in this neighborhood (too close) and I like a more intimate setting when I have friends over and that wall does the trick. It shields the area from the sun, blocks a lot of kid noise and even keeps the rain out. I LOVE it! So we covered the entire thing and then expanded it too. Now 22′ wide and 12′ deep it’s a REAL deck and roomy enough that I’ve yet to trip over a kid or a dog. No more rock and more rock either…that alone is priceless! This area with furniture is all new, covering a bunch of rock I hated. One thing about a delay? I got a killer deal on some furniture and accessories from Pottery Barn for the new area. Waiting until end of season sales was so worth it! Having enough room to have flowers and all of my herbs right outside my kitchen is a dream come true. 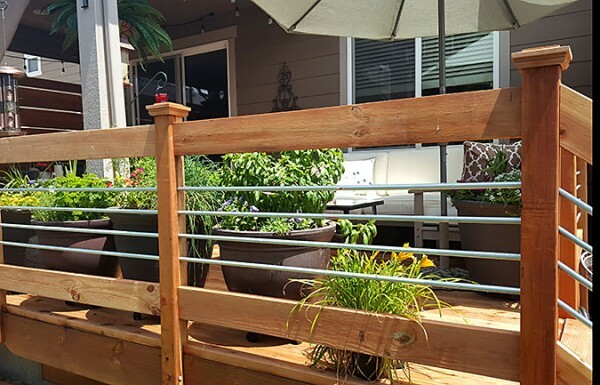 The railing was inspired by a deck I had seen in the neighborhood. I visited with the owner and he was so gracious about sharing what he had done and it turned out perfectly. 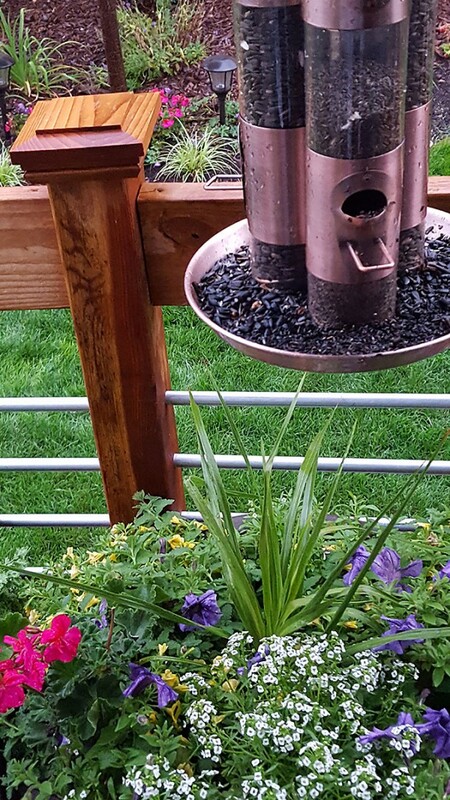 His was more metal; I made mine a combination of wood and metal. It has a clean look with a lot of openness and I love seeing my flowers and gardens that are out in the actual yard too! I spend a lot of time out here now. Every meal certainly but I can also do some social media work on my tablet, visit with the neighbor kids and of course, sip the cocktails I love making with friends…Cheers! Freeze a bottle of Rosé wine for 45 minutes to get it thoroughly chilled. DON'T forget it! Cut a small watermelon in half and cut into cubes and measure out 6 cups of cubes. Place the cubes on a tray and freeze them for at least an hour. Meanwhile make the watermelon syrup by combining the watermelon puree and sugar in a small saucepan. Bring to a boil and simmer only until the sugar has dissolved. Pour into a container and refrigerate until cold. 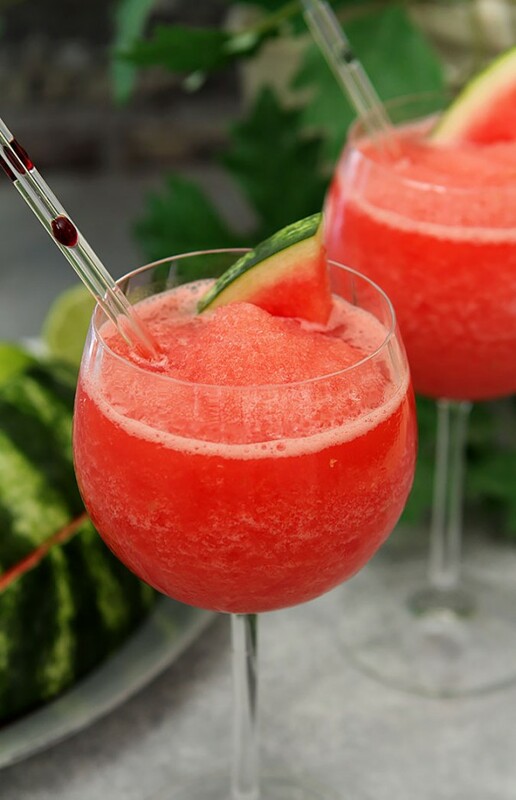 When ready to serve, combine the wine, frozen watermelon, half of the watermelon syrup and the lime juice. Blend until slushy. Taste and add more syrup as necessary for sweetness. Pour into chilled wine glasses and garnish with a watermelon slice. You might need to add some ice cubes to make the cocktail slushy...just add a cup at a time until you get the right consistency. I was provided with a bottle of the VieVité Rosé Wine to use for this recipe however all commentary is my own. 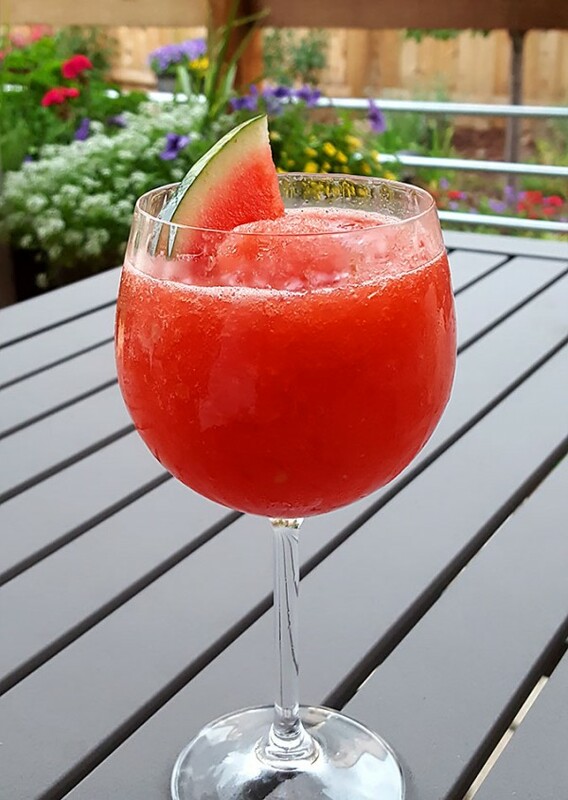 The post Watermelon Frosé – Frozen Watermelon and Rosé Wine appeared first on Creative Culinary | A Denver, Colorado Food and Cocktail Blog.